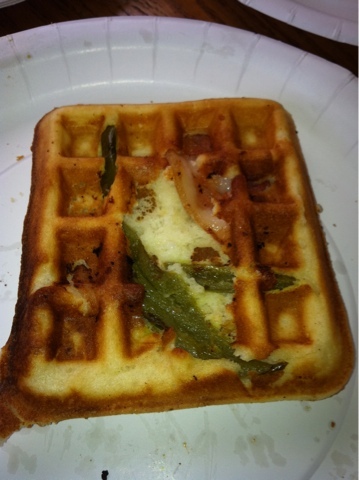 Jalapeno Waffle with Bacon, Mmm. Although my brother in law actually made this, it was an idea I had while at their house for brunch. I will try this again using a corn type mix and maybe some sweet peppers. Throw a piece of bacon on the waffle grill and let cook a bit. Throw the jalapeno pieces on there. We used canned jalapenos here. As soon as those are mostly cooked, pour the waffle batter in and close up.